The first of this week's two memorial services was held Monday in Harlem. A life-affirming photo crowns Richard Prince’s report for The Root about the memorial service held Monday for Michael J. Feeney (pictured). Feeney died suddenly at age 32 just as he was set to start working for CNN as an entertainment reporter. 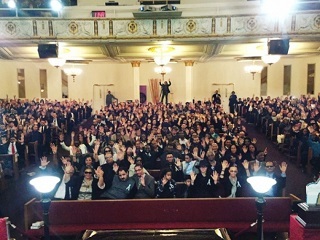 The picture was taken from the pulpit of Harlem’s First Corinthian Baptist Church by Sarah Glover, president of the National Association of Black Journalists. It was snapped right after she asked audience members to raise one hand and then the other if theirs was a life “deeply impacted” by Feeney. The unanimity of the response emblazoning Prince’s original Maynard Institute column and subsequent pick-up says it all. “Anybody who believes in God, raise your hand,” Hampton asked the crowd. The job was a short three-day tryout at The Record in Hackensack, N.J. But it enabled Hampton to write a front-page story about a controversial bear hunt. A second service for Feeney was held Tuesday at the Community Baptist Church in Englewood. RIP.